Turkish pipeline contractor FERNAS Construction employs Volvo PL4809D rotating pipelayers on the Trans Anatolian natural gas pipeline (TANAP) to bring Caspian gas from Azerbaijan through Turkey and onwards to Europe. "Volvo contracted for work on TANAP"
Gas pipelines export prosperity as much as they do energy, and TANAP is no exception. The development of the world’s longest ongoing pipeline will improve security of both Turkish and southeast European energy supply and will enable Azerbaijan to diversify its gas export market. TANAP will connect with the expanded South Caucasus pipeline and transport gas over a distance of 1850 km (1150 miles) to Turkey’s western border with the EU. From there, gas will enter the Trans Adriatic pipeline (TAP), crossing Greece and Albania before linking to the Italian natural gas network. The three pipelines form the main arteries of the Southern Gas Corridor. The flow of gas will commence at the projected date of 2018. Initially, TANAP will supply 16 billion m3/y of gas to Europe, of which 6 billion m3 will be delivered to Turkey. The gas will be sourced from Azerbaijan’s Shah Deniz II field in the Caspian Sea, and will reach Europe in 2020, once construction of TAP is completed. Gradually, the pipeline’s capacity will increase to 23 billion m3/y by 2023 and 31 billion m3/y by 2026. Final capacity is expected to be up to 60 billion m3/y of gas. The project spans from the border of Turkey and Georgia to Eskisehir province in northwest Turkey, and is being constructed in three lots. A tender was open to construct Lot 1, which will ultimately include 11 valve stations and three pig stations along its route. By the time all three sections are complete, the pipeline will have crossed 20 provinces, ending at the Greek boarder in the Ipsala district of Edirne. The construction contract for Lot 1 was awarded to FERNAS Construction late last year. This includes above ground installations and temporary camps to accommodate workers, as well as the building of pipe storage areas and access roads necessary during the construction phase of the pipeline. Established in 1982 as part of the FERNAS Group, FERNAS Construction quickly built a reputation as a leader in the fields of industrial complexes, oil and gas, energy, road construction, hydraulic works, mining, telecommunications and building. Since 1996, it has represented Turkish construction, especially in the oil and gas sector, with successful operations in Qatar, India, Iraq, Bangladesh and Oman. The company’s pedigree makes it the ideal company to handle the construction of Lot 1, which will use 56 in. dia. pipe – the largest used in the industry. The pipeline will run for 375 km (233 miles), between the Turkish village of Türkgözü in the Posof district of Ardahan (located on the country’s eastern border with Georgia) and Askale in the province of Erzurum. An estimated 150 000 pipe tubes will be required for TANAP, equating to an incredible total weight of 1.2 million t.
The construction of the US$10 billion project is progressing at whirlwind speeds. The first part of the Lot 1 section, a 79 km (50 miles) stretch between Imranli and Sakaltutan has already been completed. But the project is not without difficulties. For example, winter in Turkey, which can drop to - 25°C (-13°F), combined with its topography, makes for a challenging environment. Parts of TANAP’s route reach altitudes of up to 3000 m (9842 ft) above sea level. In these areas, the construction season can be down to only 110 days of the year. 60% of the entire route is hilly or even mountainous, with gradients up to 30°. Such is the high profile of the project FERNAS decided that it needed suitably high quality pipelayers to support them. The company is using five Volvo PL4809D pipelayers, supplied by respected local dealer Ascendum in November 2016. “This will be the first time we have worked with Volvo pipelayers and FERNAS is confident that the equipment will yield an excellent level of performance in all pipe-related activities,” said Erhan Acar, Site Manager for the first section of the TANAP project. Initially, the pipelayers will be used to support bending and welding operations before moving on to laying-in alongside conventional sidebooms. Laying-in, or traveling on steep slopes presents a hazard. As gravity takes over, the pipe swings backwards, increasing weight to the rear of the machine. However, the Volvo PL4809D’s unique 360° upper structure swing capacity allows the boom to be positioned uphill, enabling the load to be kept ahead of the machine, aiding stability and controllability. The PL4809D units are specified with a 96 t tipping capacity, or 102 twith the additional counterweight, as well as excellent stability and onboard load management system (LMS). To prevent the risk of a machine from sliding, FERNAS provided an additional safety element by equipping all five of the Volvo pipelayers with spikes welded to the tracks. “I believe that with their long booms, they will perform excellently with the final tie-ins,” Acar said. As for machine transportation: “It’s extremely advantageous when there is no need to remove the booms,” he added. These combined features played a significant role in the completion of the Imranli-Sakaltutan section, cited as the most challenging segment of the pipeline. With some 6050 pipes to be laid – each of 13 - 13.5 m (42.6 - 44 ft) long – transportation was the first trial. The site is only accessible via four roads, so that forest paths had to be used for further transport operations. Adding to the demanding nature of the project, the elevation increases up to 2800 m (9186 ft) and the terrain is extremely tough. “We managed to complete the pipelaying operation at the most challenging points during October and November, deploying 30 trucks and distributing pipes over 35 km (21 miles), whereby we have completed some 40% of the pipelaying operation,” stated Acar. Pipes for the remainder of the section were stored at accessible locations along the route. FERNAS and its operators will continue to be supported through the project by Ascendum. 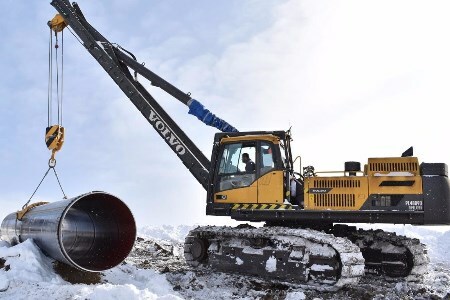 Meanwhile, in neighboring Greece and Albania, Volvo equipment is hard at work with global pipeline contractor Spiecapag, engaged in both countries on sections of the TAP pipeline as it moves to link up with TANAP. While 30 Volvo excavators and four pipelayers have been deployed for TAP in Greece, over 50 excavators – including EC380D long reach and 10 articulated haulers – are being used in Albania. In both countries, the PL4611 pipelayers will be used for unloading pipe, thanks to their 110 t tipping capacity.